The fiscal crisis is growing every month in Ukraine. The published data of the budget implementation show that the gap between the plan and the actual receipts has increased again. The tendency of growth of the obvious and hidden deficit leads to the fact that the 2018 financial year will end with the failure of the budget, and the main social items will not be allocated in full. 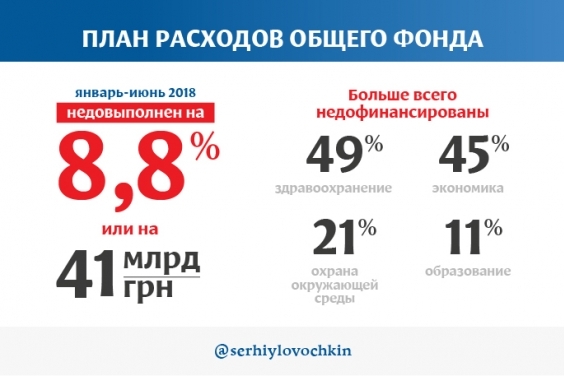 If the semi-annual plan for revenues of the general fund is not fulfilled by 3.5% (or by UAH 14.9 billion), the Ministry of Finance continues to report that the budget deficit is 9.8 billion (13 billion according to the general fund), that is, below the planned 39, 6 billion. Such manipulations became possible only because the government does not fulfill its budgetary obligations. The plan for the general fund for the first half of 2018 is underperformed by 8.8% or UAH 41 billion. That is, the real budget deficit for the general fund is not 13 billion, but UAH 54 billion. This means that almost every tenth of the hryvnia, planned for certain expenses, has not reached the recipients. What do the authorities save in 2018 on? Underfunding has affected virtually all budget lines, but in different ways. It saves the least, for example, in the Security Service –it is financed by 97.2% on the general fund of the state budget, the Prosecutor General’s Office – by 92.3%. Health care is underfinanced by 49%, economy – by 45%, spiritual and physical culture – by 29%, environmental protection – by 21%, education – by 11%. However, even catastrophic underfunding of health care in general is not the worst indicator yet. Since the allocation of funds for the preferential travel of students, the reconstruction and expansion of the National Cancer Institute, measures to rehabilitate children with cerebral palsy, subventions to implement measures to develop rural medicine and to implement measures to support the territories affected by the armed conflict in eastern Ukraine - 0%. The program for creating subsidies and their volumes remain unfunded. Salary arrears have already reached a record level for the last 15 years; this year pensioners faced a delay in pensions for the first time in many years. The debt of the population for the payment of public utilities amounted to UAH 39 billion. In such a situation, the promised raising of pensions and a minimum wage is unrealizable. The fiscal crisis will not be overcome under current political and economic policies. It can be solved only with the restoration of peace, the adoption of urgent anti-crisis measures in the economy, a new ideology of budget financing. The funds should be directed to the frozen articles on supporting the economy, which can give the effect of increasing production and incomes of citizens. Such a program will be implemented by the new power.